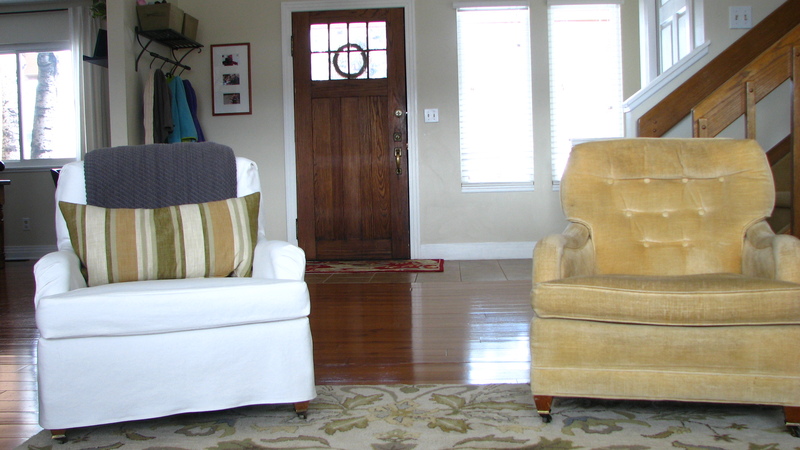 When my husband and I were just a few years into marriage, we were given a set of matching yellow chairs. They were custom made in the early ’70s, high quality, and very comfortable. We loved them instantly, and dragged them to Massachusetts with us and back—no small feat considering how heavy they are. We’ve received many compliments on how fabulous they are over the years, and they are. Cleaned up a bit, they’d look at home in Betty Draper’s living room. Trouble is, they were dirty and ripped when we inherited them eleven years ago, and they’ve only gotten worse. 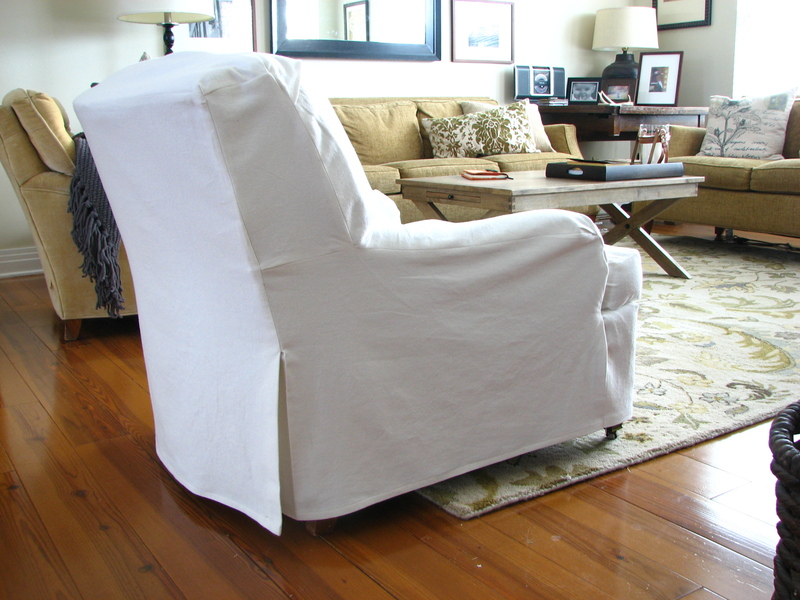 I’ve been wanting to cover them for years, but I couldn’t picture how to make a slipcover that would fit over a rolled arm, a T-cusion, and a cushion attached at the back. It was the chair arms that puzzled me the most. 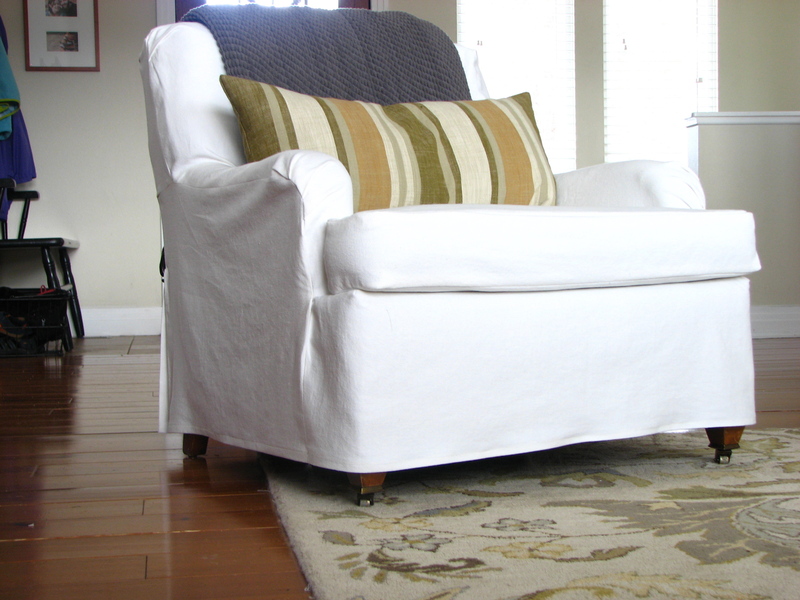 I’m not an experienced sewer, and I couldn’t see in my head what the slipcover would need to look like. 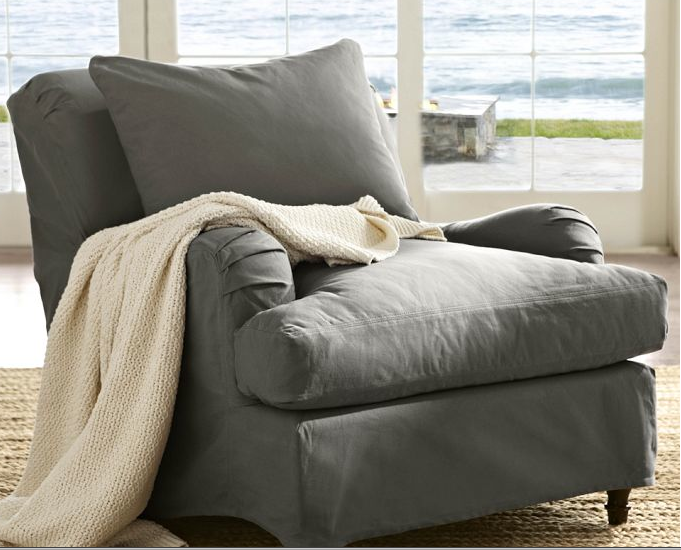 Then one day last year I saw Pottery Barn’s Slipcovered Carlisle chair in their catalog, and—Aha!— I could suddenly see what my slipcover needed to look like. Isn’t it a great chair? For $1,000 it outta be. I love the way the pleats wrap around the curve of the arm. So I decided I’d try to copy it. But then I put off buying fabric for this for a long time. This project was a reach for my skill level, and it was hard to commit to bringing the vision in my head into reality. The money spent on the fabric could well have been money out the window. And there are so many better things to do with money. 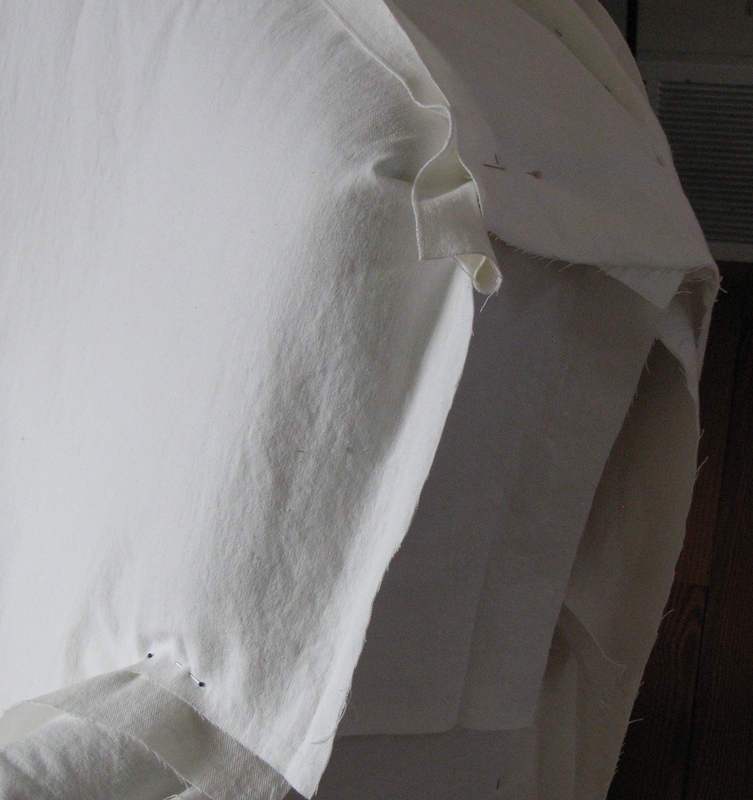 But a few weeks ago I bought 4 yards of white denim fabric and got to work. Actually I came home and looked at my chair a long time, measuring and estimating the different sized pieces I’d need to pin together. My local fabric store only had 4 yards of this fabric in stock, which I’d estimated would cover one chair with a little left over. I went to another store in town to check out their white denim, but it wasn’t as heavy. 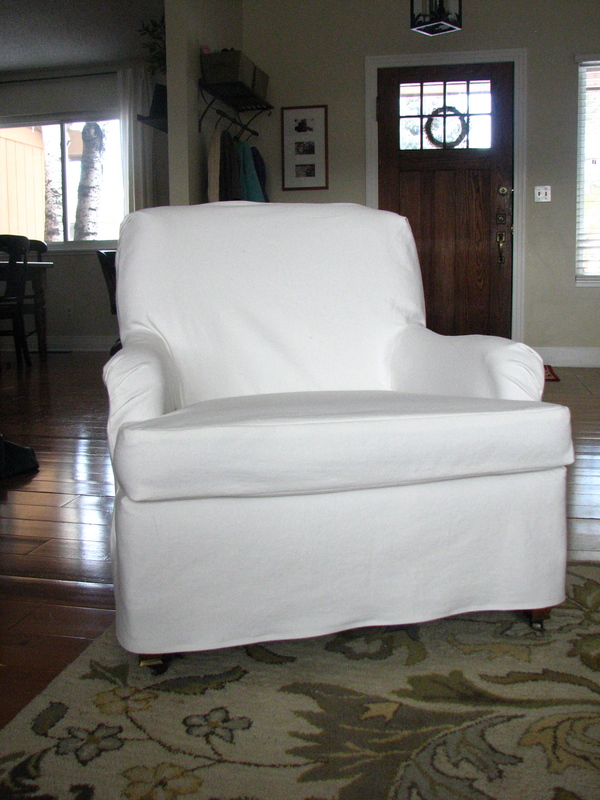 I’m ordering the exact fabric for the other chair online, so it should be here soon. 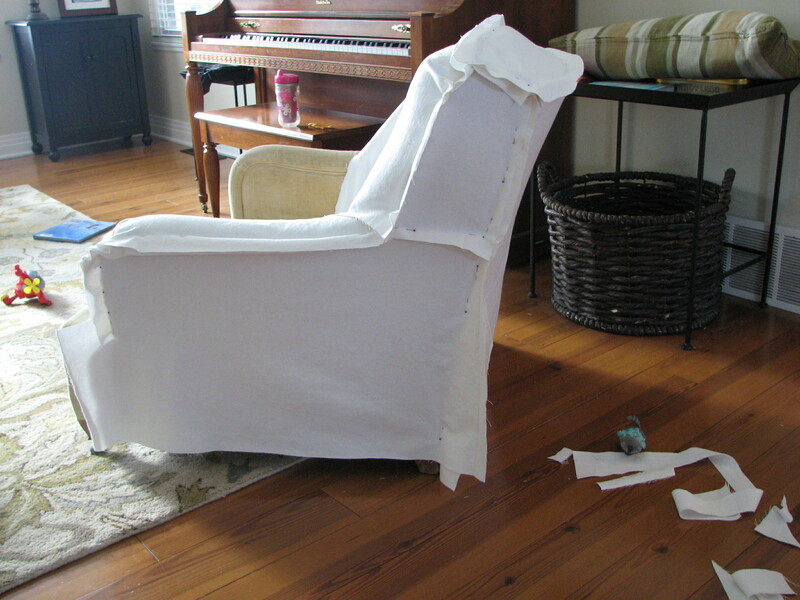 Once I cut out the pieces I needed, I began to pin them around my chair. In the picture below I had the pleats wrong. I flipped it inside out and realized I needed my pleats to fold up instead of down. But through trial and error, pinning and re-pinning, I got the right shape. You can see I had a lot of excess around the edges. 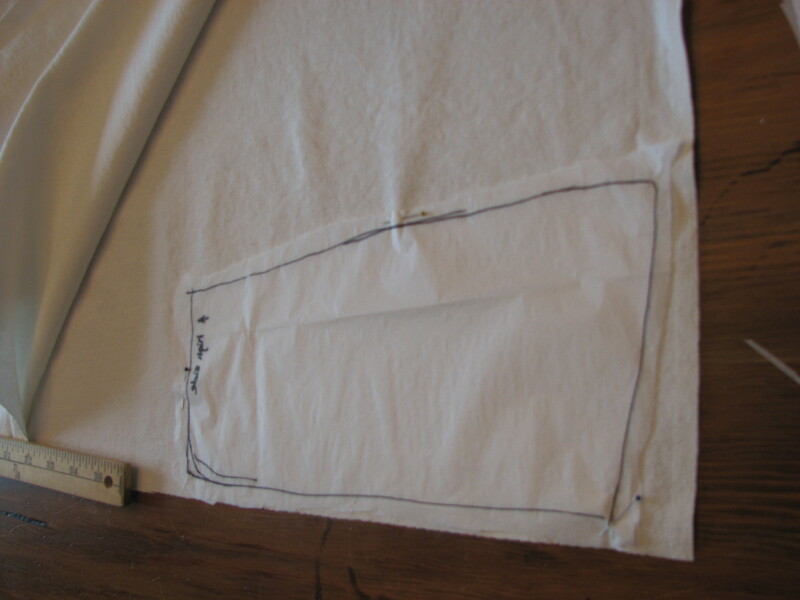 But once I had the pieces pinned like I wanted, I trimmed the seam allowances to a manageable size. I worked a little bit at a time over several days. 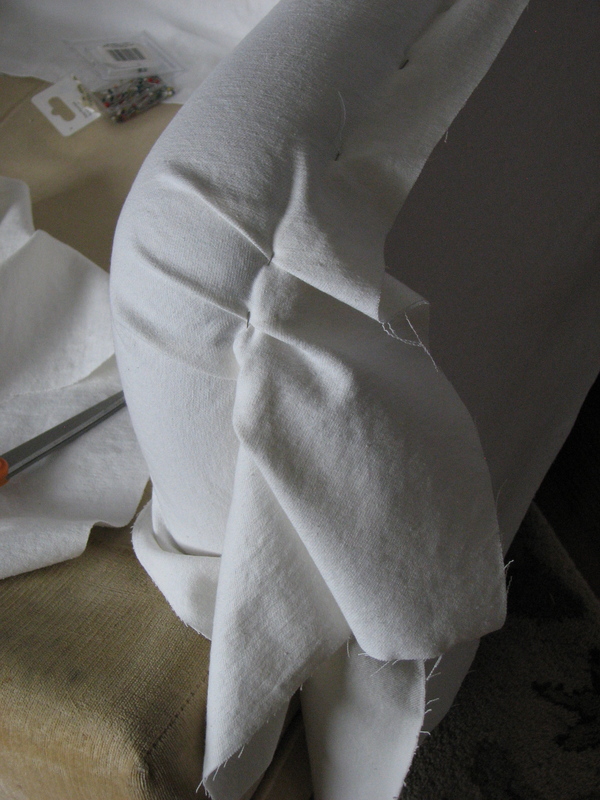 We’ve had a lot of cold, snowy weather, and it’s been perfect for sewing. The hardest place to pin was at the base of the rolled arm. 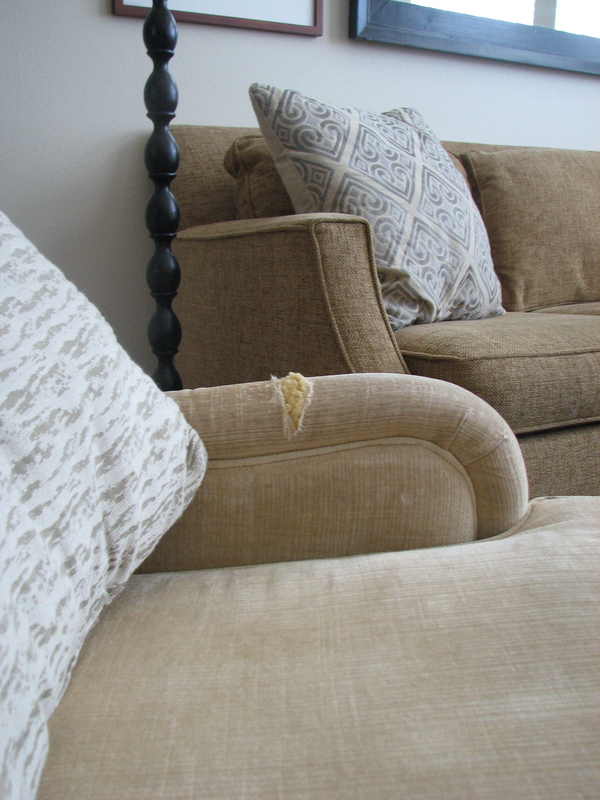 Fortunately this area is covered by the cushion. 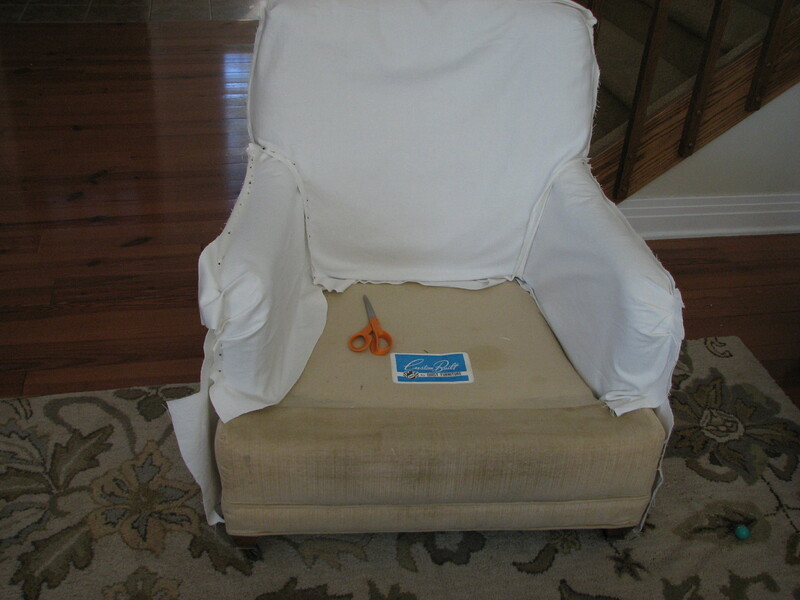 Every time I figured out the shape of the piece I would sew, I made a pattern on tissue paper to use for the other side of the chair, and eventually this is what I will use for the other chair. I figured this would be my best chance of getting the two chairs to match once everything was all said and done. It worked, but it was slow going. I’m finally done! With just one chair, but still, I did it! I’m really pleased with how it turned out. Here are the two side-by-side. Betty’s chair is looking a little less fabulous next to its decked out partner, but it will soon match. Whatever you think of the yellow chair, it looks worse in person, and this is the cleaner of the two. Plus, it’s full of holes. Now cue the grape juice spill! It’s inevitable that one of us will spill something on this white fabric soon. 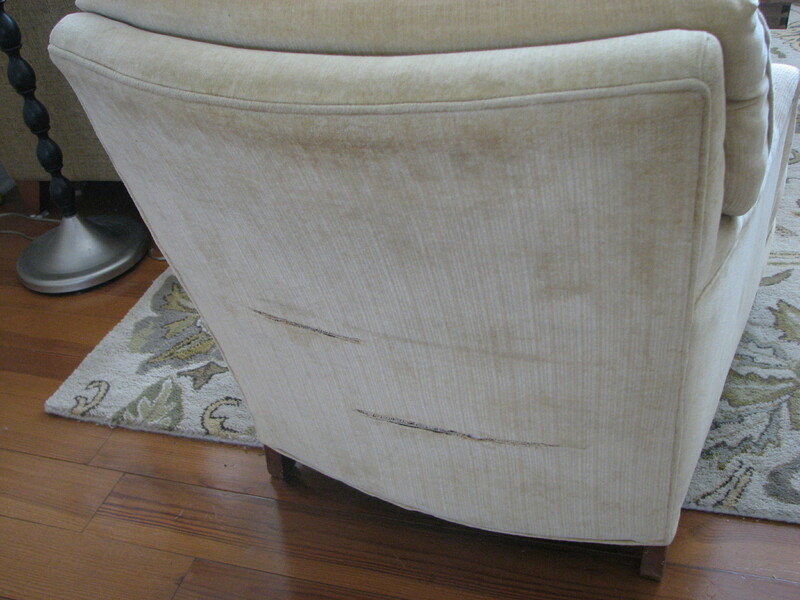 I’ve been admiring white slipcovered furniture in decor magazines for years and have always thought it was just not practical for a house with little ones and a dog. But I’ve also read that white is easily bleached. So I’ve decided to take the plunge and try it. Hopefully whatever hits it will come out in the wash, with a little help from OxiClean. Just in case, I’m keeping my patterns. 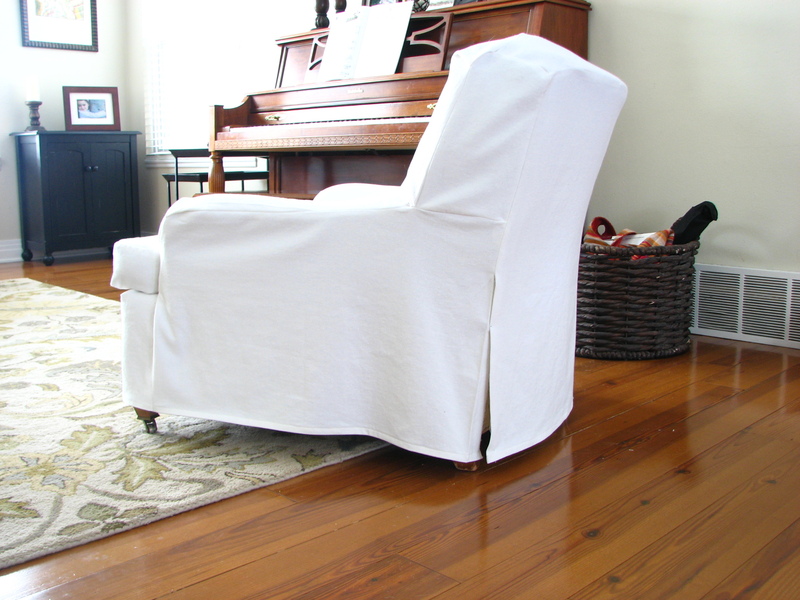 If you want to read about how I stained the yellowed-oak banister in the picture above a darker finish, read about it here.